Elections to select successors to Archbishop Fred Hiltz (left) as Primate of Canada and Archbishop John Holder as Primate of the West Indies will take place on 13 July (Canada) and 27 May (West Indies). 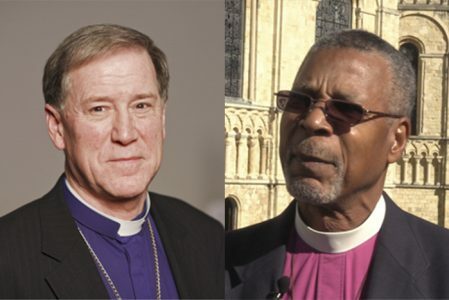 The Church of the Province of the West Indies and the Anglican Church of Canada has confirmed the dates that their new Primates and Archbishops will be elected. The new Archbishop of the West Indies will be elected on Monday 27 May; while the new Archbishop of Canada will be elected on Saturday 13 July. Both will be elected during meetings of their Provincial Synods. The new Primate of the West Indies will succeed Archbishop John Holder, who retired as Primate and Bishop of Barbados in February 2018. Under the canons of that province, the election of his successor as Primate and Archbishop could not take place until the election of his successor as Bishop of Barbados. On Saturday (26 January) – after a near-year-long election process – Bishop Michael Bruce St John Maxwell was consecrated as the 14th Bishop of Barbados during a special service at the Garfield Sobers Gymnasium in St Michael, ahead of his installation in the island’s St Michael’s Cathedral on Monday. 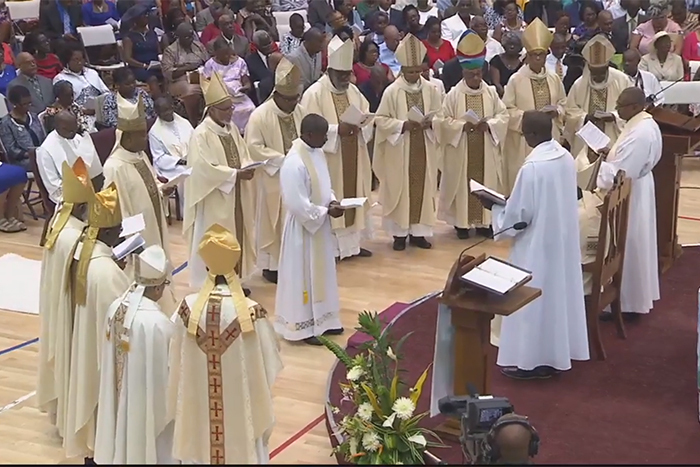 The Bishops of the Church of the Province of the West Indies consecrate Michael Bruce St John Maxwell as the 14th Bishop of Barbados during a special service at the Garfield Sobers Gymnasium in St Michael, on Saturday. It has now been confirmed that the Provincial Synod will take place from 24 and 31 May 2019 in Trinidad and Tobago. The election of a new Archbishop and Primate will take place at the Synod on Monday 27 May. Under the canons of the Church of the Province of the West Indies, the new Archbishop will continue to serve as a bishop of their diocese. Meanwhile, the Anglican Church of Canada has published details of the process for the election of a successor to Archbishop Fred Hiltz, who stands down on 16 July – the last day of the Province’s triennial General Synod meeting. The Synod will meet from 10 – 16 July in Vancouver, British Columbia and will elect a new Primate. Under the canons of the Anglican Church of Canada, the Primate serves as a national Archbishop of Canada and steps down as a diocesan bishop. The Canadian process of selecting a Primate comes in several phases. In the first, members of the National House of Bishops nominate bishops for the office. In the second, during a meeting of the House of Bishops in March, a series of ballots will take place to create a shortlist containing between three and five names. The third phase involves “a conversation throughout the whole Church, not only about the nominees, but about the nature of primatial ministry”, Archbishop Fred said in a letter to the Church released yesterday (Tuesday). This leads to the fourth phase: the election of the new Archbishop and Primate in Christ Church Cathedral, Vancouver, on Saturday 13 July. After a celebration of Holy Communion, the bishops of the Church will withdraw to a separate meeting, where they will pray for the guidance of the Holy Spirit on the lay and clergy members of the Synod, who form the electorate. “Once an election is declared, the bishops join the delegates in welcoming the Primate-elect”, Archbishop Fred said. “In that short span of a couple days between the election and the installation, the new Primate will be asking for our prayers”, he added. “In my own experience, it is heartening to know that one is remembered daily by name and for need of grace, strength and wisdom in the exercise of this ministry. The Primate-elect of the Anglican Church of Aotearoa, New Zealand and Polynesia, Fereimi Cama, will be consecrated and installed as Bishop of Polynesia and Archbishop at Holy Trinity Cathedral, Suva, on Sunday 10 March. He will join the Province’s two existing primates, Archbishop Don Tamihere and Philip Richardson, in leading the three-Tikanga (cultural streams) Church.